Eric Balfour’s face began to dissolve in shame when he realized the quality of the film that he starred in. It’s a complete waste of time, devoid of entertainment, miserably paced and nightmarishly written (and as a result, poor acting). I urge you not to watch it, and to run far away from any place where it might be viewed. This movie fails catastrophically on nearly every level. There’s really not much more to say. It failed miserably. Did I mention that already? This movie was directed by Greg & Colin Strause, brothers who collectively are credited as “The Brothers Strause”. That name is so terrible I refuse to dignify them with that. Apparently, they were angry that 20th Century Fox refused them plenty of creative control over Alien vs. Predator: Requiem, and they made this movie to show what happens when they have everything for themselves. If this is any indicator of what they can “accomplish” maybe Fox’s actions were totally justified. The plot is minimal. In Los Angeles (and many major cities around the world, we’re led to assume), giant robot alien spaceships suddenly descend uponEarth one night, beaming a vivid blue light everywhere. If you stare in it too long, you’re slowly transformed to be captured by the extraterrestrial visitors, and entire cities are destroyed in the fight. The story is personalized with the introduction of a couple, Jarrod (ERIC BALFOUR) and Elaine (SCOTTIE THOMPSON), who fly to LA to celebrate the birthday of a friend, Terry (DONALD FAISON). And then, the stuff in the paragraph above happens. Is there a saving grace in Skyline? Yes. One glimmering ray of hope in a sea of sub-mediocrity. The visuals. It must be admitted that the alien spaceships look kind of cool as they descend upon our mortal (3rd) rock (from the sun). It’s lovely to watch. The script, written by Joshua Cordes and Liam O’Donnell, is terrible. It must be blunt, it’s terrible. We don’t know who these characters are, with the exception of maybe or direct principal characters, are mentioned maybe three or four times maximum, spread out beautifully so we don’t know a thing. There’s so much material in between we can’t figure out anything! There’s no character depth, either. Usually in sci-fi movies, we’re not looking for character depth, but the inherent lack seen here was enough to justify wanting some of it anyway. The iMDB revealed that Cordes and O’Donnell had never written a screenplay prior to this, and all their other credits went to that of visual effects specialists, on Alien vs. Predator: Requiem no less, the film which sparked this from the oppressive nature Greg & Colin Strause were placed under from 20th Century Fox. The bad script segues into the bad acting, as I mentioned before. It’s shockingly unmotivated and uninspired, considering the circumstances these characters are plopped in to. The Stanislavski method of acting consists of letting yourself, as an actor, remember with great intensity a situation within your own life which was similar to the one you’re presented with in the project, and running off the fumes of that memory. I will admit it’s sort of hard to do that in an alien invasion movie, but did you see Will Smith in Independence Day? I mean that was pretty good! Some technical stuff in this movie doesn’t make a lick of sense either. The continuity errors are many and frequent, including a rather telling instance when we notice characters with mustaches that appear and disappear between shots. Everything here is so densely confusing, unexplained, and later, boring, that it’s impossible to enjoy in any way, shape, or form. At one point in Skyline I wondered if Joshua Cordes and Liam O’Donnell were really real people? It seemed impossible. There’s nothing original here, just a bunch of generic action shots and generic rushed conversations to generic dramatic music. 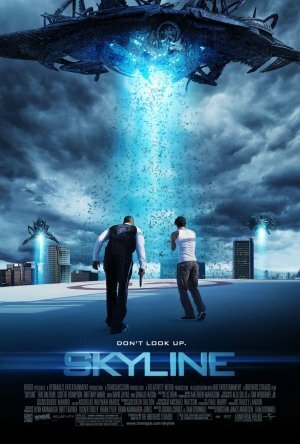 In the end, don’t watch Skyline. Don’t do it. No. Never. No. Never. No location, time, or place can excuse a movie with awful pacing, lifeless acting, a garbage screenplay, and a running time so short that it was extremely obvious that an epilogue-ish scene at the end was there just to try to beef up the running time (which, by the way, barely eclipses an hour and a half). You want nice visual effects with a good story? Go watch Hugo. You want better visual effects with a lukewarm story? Go watch Avatar. You want nice visual effects with an insultingly bad story that will haunt you for hours after watching it that’s so boring it makes watching paint dry look like next year’s national pastime? You’re probably still too good for this movie.